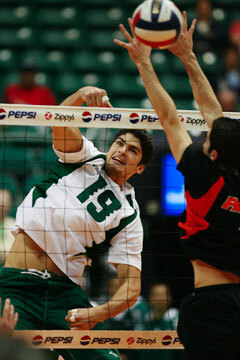 Dio Dante of Hawaii put one of his five kills down against Pacific last night. Looking very healthy and very solid, No. 5 Hawaii swept into the win column last night, picking up its first win of the young men's volleyball season. Sophomore opposite Jim Clar's career-high 14 kills led a balanced attack in which all five Warrior attackers put down at least five kills in a 30-26, 30-21, 30-28 victory over No. 11 Pacific. It took just 102 minutes for Hawaii to avoid its first 0-3 start in the program's history and defeat the Tigers for the 29th time in 30 meetings. A Stan Sheriff Center crowd of 1,852 (3,161 tickets) watched the Warriors improve to 1-2 overall and in the Mountain Pacific Sports Federation. The Tigers fell to 2-4 and 1-2 heading into the rematch tonight at 7. "We came together as a team at the end," Clar said. "We played as a team, put it together. Brian (senior setter Beckwith) spread the wealth and it makes it a lot easier when you don't have one guy taking 50 swings a match. "We're still trying to find a lineup and play together as a team." It was a team effort, on offense with senior hitter Lauri Hakala and freshman middle Matt Rawson both putting down nine kills each. Freshman hitter Matt Vanzant added seven and senior middle Dio Dante five as the Warriors hit .344 for the match. UOP was led by Maor Nutkevitch's 13 kills with Pekka Seppanen adding 11. The Warriors outblocked the Tigers 12 1/2 to 7 with Rawson in on eight and Clar six. "The biggest difference is we cut down on our errors," Beckwith said. "We still missed a lot of serves, but not at crucial times. We stayed pretty focused at the ends of games. "I love to run an offense that's real spread out. But that all depends on the passing. Tonight, our passing was phenomenal. We still have some adjustments to make. Our defense was good, we've been having great rallies in practice and we were able to give our fans a little bit of the Wahine feel." Except for a lapse at the end of Game 3, Hawaii was in control most of the night. UOP trailed by as many as five, 21-16, before rallying to knot it at 25, the tying point coming on senior setter Garrett Morales' ace that landed just inside the back line. 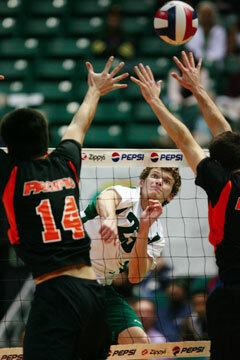 Matt Vanzant of Hawaii had seven kills last night as the Warriors swept Pacific for their first MPSF win of the season. The Warriors seemed poised to finish it off quickly when kills by Hakala and Clar pushed UH to a 27-25 lead. The Tigers roared back with three unanswered points to take their first lead since early in the game at 28-27. Hakala, playing on the left after an All-American season at opposite a year ago, put down his ninth kill to tie it and then teamed with Rawson to stuff Nutkevitch for match point. Clar and Rawson then stuffed Matt Cornell to end it with the Warriors' 12th block. "We did not execute, we did not play," Tiger coach Joe Wortmann said. "Our serving was mediocre at best. "I thought we scouted them really well. We said this is how we're going to play defense, this is what's going to happen. It happened and we didn't respond. Hawaii's a good team. The reason they've lost is they've played the best Canadian team (British Columbia in two exhibitions earlier this month) and the best U.S. team (No. 1 UC Irvine last week)." Although Hawaii committed 14 serving errors, the mistakes didn't come at critical times. The Warriors also had impressive defense with 26 digs, eight by senior Eric Kalima, who has returned to libero. "At the end, we dug deep and the passing was good," Kalima said. Around the league: In last night's only other MPSF match, Jon Grobe (Iolani '02) had nine kills and three block assists to help Pepperdine turn back UC San Diego in four. Will Ehrman (Punahou '06) had nine kills, two aces and two block assists for the Tritons. Aces -- Pacific (2): Morales, Nutkevitch. Hawaii (0). Assists -- Pacific (42): Morales 39, Hammer 2, Forbes. Hawaii (42): Beckwith 40, Dante, Kalima. T -- 1:42. Officials -- Jesse Martinez, Dickson Chun. A -- 1,852.